He may not be ready to swing through the trees and he still likes his bananas mashed, but the crowds will go bananas for this little jungle urchin. 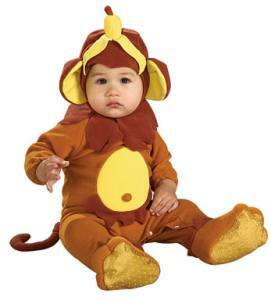 The Monkey See, Monkey Do Fancy Dress Costume for babies comprises of a brown and yellow onesie with monkey detail. It closes with snap studs in the back and there's inner leg snap closure for easy nappy changing. Non-slip soles on the feet are a great safety feature and the hands are left open for play. The hat with the monkey ears and the split banana design has a Velcro attachment and the costume comes complete with a monkey tail. This one size costume is designed to fit most babies between approximately 6-12 months and costs £18.99 online.